You are currently browsing the tag archive for the ‘bloggiesta’ tag. I’ll write up my finish line post tomorrow, but this morning I promised to show you my lunch of leftover sushi and I always make good on my promises. 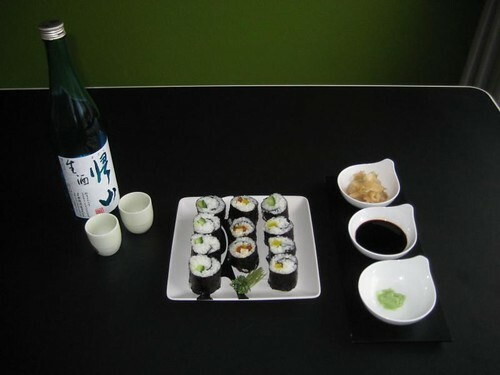 There’s kappamaki (cucumber) on the left, daikon maki on the right and some ‘triple whammy’ sushi rolls in the middle containing kanpyo, daikon and tofu. Rianne also made us inarizushi (tofu puffs) but we ate them all last night… There’s a picture of all yesterday’s sushi on Flickr! What have I been doing since my last update? Oooh Nooooos! Another Foodie Challenge… > also added to Weekend Cooking and Whip Up Something New! I think 20 (and-a-half) hours is a nice figure to round off with. I had a lot of fun and feel really accomplished — which was my main goal for this edition of the Bloggiesta! See you all next time around?! The hard part is that I am now tempted to go awol again and try those Japanese rice patties I’ve been wanting to make ever since Leeswammes posted about her rice cookies… They would go marvellous with last night’s makizushi! But for now I intend to be strong and write up blogposts. Hey ho let’s go! Olé! Day 2 of the Bloggiesta! Tonight I’m going to have sushi at a friend’s place and watch Chef of South Polar, a movie about a chef delivering mouth-watering extravagant dishes to the crew of Dome Fuji Station, a Japanese research base on the South Pole. Sounds like fun! Of course it means I will have to leave the Bloggiesta party at 5 o’clock, but hey — I had decided not to blog anymore in the evenings, remember? How’s Day 1 of the Bloggiesta Party Going? I’m pretty content with what I’ve done today! Since my first update I finished my urgent ExtraVeganza post and did some odd jobs ‘off the grid’. I looked into an articles template plugin in vain: plugins are only allowed on privately hosted WordPress blogs (wordpress.org) and not on the free wordpress.com. My Friend Amy’s mini-challenge about setting goals for your blog. I knew you were all going to squeal with jealousy but I still wanted to show off my Mexican Bloggiesta Lunch. Sorry ;) You probably won’t believe me but it was all made with leftovers! The chili is another recipe from the Dutch vegetarian website De Vegetariër, and you’ll never guess what’s in it… espresso! 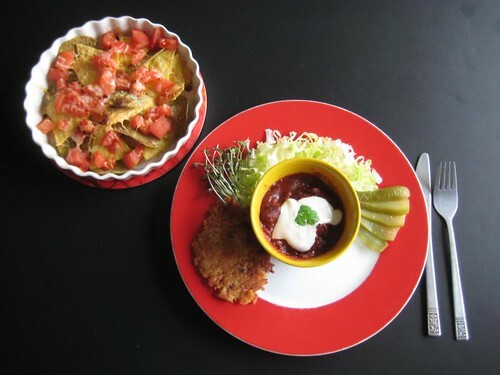 I also had two open packages of nacho chips threatening to get stale — okay, so I should have paid more attention to the oven temperature but most of it was fine ;) Of course the beet pancake isn’t really Mexican but it fitted this meal perfectly anyway. There’s still an open can of tomatoes in my fridge, along with a package of passato di tomato, so later on I might even make some of my super flexible salsa picante. Progress: the draft of my ExtraVeganza post is finished, I just need to fine-tune a little and want to add a compilation of photo’s for which I need to get reacquainted with Qimp. Of course I also went an did some stuff that wasn’t on my original list. Get Out the Nachos, it’s Bloggiesta Time! Hooray! The first day of Bloggiesta has finally come. It’s a weekend long fiesta where people across the globe fix, tweak and pimp their weblogs. Follow us on twitter by the hashtag #bloggiesta! I’ve cleared most of my schedule so that I can fully commit to the list of things I want to get done. I’m not that naive to think I’ll be able to cross off each and every task, but I hope to make some progress. My main goal is to feel accomplished! I plan to update at least every morning, and every night when I stop working on Graasland, but I’ll be doing that in 1 post a day. Apologies if you might feel I’m clogging up your feed-reader anyway! I’ll probably write my finish line post on Monday. Local take off time: 8.00 am (Utrecht, The Netherlands). Good luck to all participants — and HAVE FUN! Plan. Edit. Develop. Review. Organise. From Friday to Sunday I’ll be participating in the 4th Bloggiesta Fiesta hosted by our ever faithful Natasha from Maw Books Blog. Since I joined for the 2nd edition I always look forward to this semi-yearly event. In preparation I’ve compiled a list of things to do and grouped them into ‘quick & easy‘, ‘bigger jobs‘, ‘possible posts to write‘ and tasks to do ‘in advance‘. review of Christmas Quilt/The Sea/Affinity/Golden Pavilion/Pillow Book etc. Purge that Pantry! Challenge / Eating vegetarian in Funchal, Madeira / Fav Indo Restaurants etc. If I feel accomplished enough about the stuff I’m getting done on my own blog, I might also put in some time for the Dutch Kookgrrls’ weblog which I’m regularly contributing to. Do you want to get some major work done on your blog while partying with the rest of us? There’s still time to join!